The Evangelical Alliance has just released on its new website an article Healing on the Streets advertising appeal. 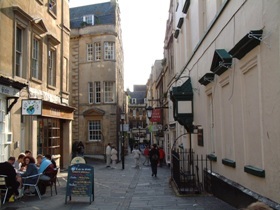 This article reports that HOTS Bath is appealing to the Advertising Standards Authority against the ASA ruling that it must not claim that God heals today – as I already reported in my post God Heals Today through Prayer – Scientific Paper. For more background see my post God can heal, but not to meet advertising standards. In liaison with the ASA the [Evangelical] Alliance has been seeking to produce some agreed guidelines to help churches when advertising, highlighting areas that have proved problematic and indicating how to avoid breaking the guidelines. The ASA has refused to budge from its insistence that any public advertising of the historic Christian belief that God is able to heal people physically must be prohibited. The only form of healing the ASA is willing to countenance is what they describe as ‘spiritual healing’. We presented our case (accompanied by legal experts) to the ASA that not only was their attitude unfair and uncomprehending of orthodox Christianity, but that it was probably illegal. In particular, we argued that the attitude of the ASA could be not only in breach of Articles 9 and 10 of the European Convention on Human Rights relating to freedom of belief and speech but they may also be discriminating on grounds of religion and belief. A recent case in the Northern Ireland High Court has confirmed this view. Whether the ASA is acting illegally or not, it is to be regretted that the ASA ultimately refused to work with the Alliance to find an acceptable way forward that met the concerns of both sides. The reality is that the ASA has little legal power to enforce such a rule, though they could try to make life difficult for local churches. HOTS Bath has appealed against the ASA decision, though based on previous experience a positive outcome is doubtful. It will be interesting to see where this goes. But we must remember that for Christians the ASA, like the devil in 1 Peter 5:8, may roar like a lion but is ultimately toothless. I was made aware of this information privately a few weeks ago and was very saddened to hear that the ASA was being so unwilling to work with the Evangelical Alliance to find a satisfactory way forward. Fortunately they have little power, but they can still cause churches and Christian organisations like HOTS a big headache. Last summer I listened to Heidi Baker talking about the scientific study carried out involving her. Those doing it were amazed at the healings they saw. The ASA is not bothering to consider any factual research and testimonies into whether God can heal. It is easier for them to ignore it otherwise they would have to agree that God can heal and I don’t think they want to go there. I find the ASA’s position on this baffling, to be honest. You can’t put out any advertising that indicates that God can heal, at all. It seems to me to be a short step from that to making churches take down posters which proclaim “Christ is Risen”, “Jesus saves” etc. It goes along with the whole “religion is fine, but please keep it in your private life” thing which seems to be happening more and more recently. Thank you, Gillan and Phill. Yes, the ASA seem to be pushing a more and more common secularist line. I could trace the same line into the gay marriage debate, but enough electronic ink has already been spilt on that one over the last few weeks – although I may weigh in on it myself another time. When you have spent as much time as I have on the cancer wards and have been told again and again by devout patients – often with young children and everything to live for – that ‘Jesus will heal me…’; and you then watch them die – and die painful, drawn-out, messy deaths – it is hard to get overly enthusiastic about the notion of healing. My father is a qualified ‘spiritual healer’ at his local Spiritualist church. He did a year long course for which he received a qualification at the end from some British association of spiritual healing or the like (B.A.S.H.!?). A good deal of the training is around ‘not over stepping the mark’; hence if a ‘patient’ comes to one of the healing sessions saying they have a lump or a pain or other symptoms, a record is made, the ‘patient’ given a session of healing there and then but told no further healing will be given unless the ‘patient’ visits their doctor. If the same person appears next week and hasn’t seen their GP, then they are refused healing until they do so. Similarly ‘healers’ are taught never to be alone with a ‘patient’ – they always work in pairs, and that any child presented for healing must be questioned as to whether they really want the healing or whether it is their parents’ doing the pushing; and if ‘healing’ is given, it is done with a parent present. Nor can the healers accept any money or make a charge for their services – tho’ donations can be made to the ‘church’ (which holds civil charitable status, like any other religious institutions). There are two points I want to draw out of this little illustration. The first is this, how many Christians reading this page would be comfortable if a person from the local spiritualist church advertised in the street, telling them that they could receive healing at the local spiritualist church? Or let’s take the analogy a little wider – I often visit UCL Library at Senate House and so get the Northern Line to Goodge Street; as I leave the station there is a ‘Church of Scientology’ outlet (for want of a better word) next to the station. Passersby are invited into the ‘church’ to measure their stress levels – having worked in and known the area for many years I know that this is far less aggressive than it used to be – but it still goes on (I suspect the civil authorities have made the ‘church’ tone down its stressful marketing of its ‘anti-stress’ claims). Again, if the Church of Scientology began handing out fliers like the one above, would mainstream Christians think this was okay? Or the Hare Krishnas on Soho Street, or the Buddhist Temple on Margaret Street? I am guessing here, but I think many Christians would be a little affronted by such militant ‘Claims-Mongering’ – and I know not a few (including myself a few years ago) who would happily tell our devout friends that their beliefs are in error and that they had best get on their knees and accept Jesus Christ their Savour into their lives, pretty sharpish, if they really want to be healed and save themselves from a one way ticket to Hell! So what is special about the Evangelical ‘claims’? As with the spiritualist church et el, it can’t offer any ‘independent’ proof of its claims of healing – tho’ it can also offer (as I have learned from years as a palliative care and disabilities social worker (not to mention mental health)) a good deal of false hope. Christians often use the ‘get out clause’ of: ‘Some of my colleagues tell me that healing is always there, but not generally physically, it’s about healing mental and emotional stuff and therefore, even when the symptoms (and cause) persist, the person is healed.’ (this rather flies in the face of Mk 16:18, but we’ll move on!) Which even the most charitable have to admit is a bit of a cop out! So my question is, why should Christians, unable to offer any substantial ‘proof’ of healing – apart from the odd story that someone they knew, or the odd cherry picked journal article that is rather guarded about its findings! Or because someone said that someone at a church of a friend had once been miraculously healed – be seen as any different to the spiritualists or Scientologists? Is it not, therefore, the duty of the state to protect society from the excesses of other people’s enthusiasm for their own Credo? If NHS Direct was being put out of business by the local church, then I’d say stuff the ASA, but it is not – and, I am afraid, it is doubtful it will be except for the odd anomaly that appears once in a while out of tens of thousands, if not millions, who are prayed with and yet continue to suffer their illness. Just for the record, my father was diagnosed with cancer nine years ago and told he had between two and five years to live. He now has no trace of the cancer in his body. Should his Spiritualist Church be able to freely advertise that people can be cured through spiritualism, because my father believes it is through this church he has been healed? Perhaps what we should be asking is where do the vast majority of members of the EA go to be healed when they are ill? Do they go to their doctors or do they rely on PiP? I think the way forward for this little problem is that all members of the EA come off any medications they are on, cancel any medical treatment or appointments they are having and really put their money where their mouths are. Then – after a year of just PiP and if there is a scientifically proven ‘cure’ rate for their ills, then the ASA and go and take a jump… What do you say? Peter, thank you for your carefully argued comment. Your perspective as one who deals with cancer patients is important. I too know, although not from the messy end, of people who have been trusting God for healing but have died. So I understand the difficult issues this raises. Nevertheless I have also seen cases of people being miraculously healed in response to prayer. Why are some healed and others not? Only God knows. I am by no means arguing for special treatment for evangelical Christians relative to any other faith group. The same rules should apply to all. Some Christians might not like that, but we should realise we can no longer claim a privileged place for Christianity in secular law. Also I would not argue for a free for all in advertising for healing. There needs to be some regulation of the claims made. But this is where the ASA is failing in its duty: by trying to make a blanket ban on all claims of physical healing, without even considering the evidence, it refuses to draw a proper line between reasonable and excessive advertising of such claims. In western countries the majority of Christians in healing ministry, just like your spiritualist healers, encourage those they seek healing for to continue to see their doctors, and to continue with any medication until medical advice changes. So there is no question of making a choice between relying on doctors and relying on PIP. But sadly there are a few mavericks out there who give the rest of us a bad name. And if the same doesn’t happen in rural Africa, it is because there aren’t any doctors nearby to see.